i hope everyone enjoyed the long weekend! it was ridiculously hot here, but i managed to get a couple bike rides & hikes in. last night we went to niagara on the lake (my absolute favourite place) for ice cream & walked the longest trail of life. we kinda got lost which may explain why it was never ending, but all in all it was a perfect sunday night. the night before that we went to the ice cream farm i grew up going too, i guess you can say ice cream was a theme this weekend! i also made these cute little galettes! because MANGOS! how could i forget about mango season?! i used to get so excited every time my mom would bring one home from the market because it's not your boring old apples & bananas (no offence guys). 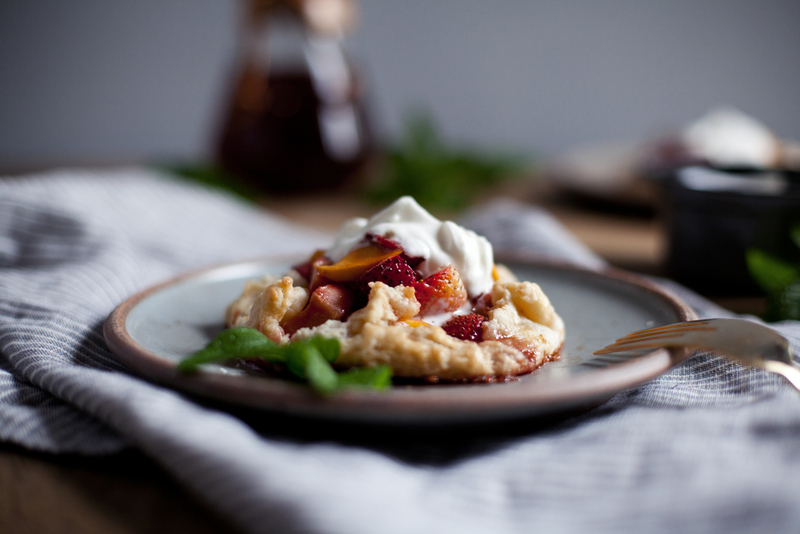 these galettes make for the perfect fruity summer treat & come together much quicker + easier then a full on pie! no need to be a fancy baker for this rustic dessert. i usually go with a butter & shortening based crust when i make pies, but for these galettes i decided to stick to a full butter based crust. i love how the strong flavour of butter comes through! try not to eat them all yourself. in a mixing bowl add flour, salt & sugar. stir until evenly mixed. add cubed butter & using your hands work the butter into the flour mixture until a crumb like consistency is formed. add the ice water & shape into a disc. if dough seems a bit wet, add a touch more flour. if dough seems a bit try, add a touch more ice water. wrap in cling wrap & let rest in the fridge for an hour or over night. in a mixing bowl add strawberries, mangos, sugar, lemon juice, salt & cornstarch. toss until combined. divide dough into four balls & roll out into a circular shape (between 1/8 inch & 1/4 inch for thickness). add filling to the centre & fold in the edges. brush with egg wash if desired & sprinkle with a touch of raw sugar. bake for 20-25 minutes or until the dough begins to lightly brown. serve warm or cold with fresh whipped cream!